Sauder Village in Archbold provided an artist’s rendering of the 1920s Main Street Community currently under construction. 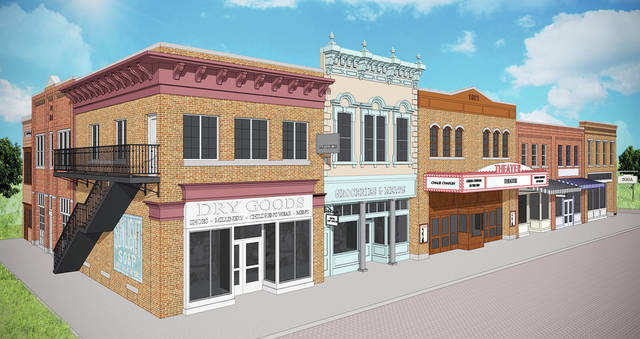 Sauder Village in Archbold has begun work on Phase Two of its 1920s Main Street Community, with contractors working on site preparation, building relocation, and new construction to continue the replication of a 1920s Main Street typical to northwest Ohio. While funding has been secured to begin construction, partners are still needed to complete the project. The Walk Through Time at Sauder Village has been developed over the past 16 years with the help of staff, volunteers, contractors, donors, and capital funding. Guests can experience more than 120 years of Great Black Swamp history while traveling from Natives and Newcomers to Pioneer Settlement, The Grime Homestead, and soon even more of the 1920s. As construction continues over the winter, project updates will be posted online with photos of the progress, stories, and interesting facts about the 1920s. Project updates can be found online at saudervillage.org/explore/walk-through-time/1920s-main-street.